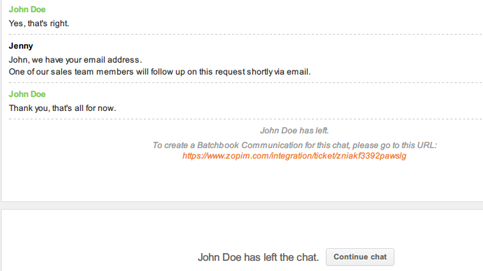 Note: The Batchbook-Chat integration is only supported for standalone chat accounts. Accounts integrated with Zendesk Support cannot use Batchbook for Chat. With Zendesk Chat-Batchbook integration, you can share important visitor information between Zendesk Chat and Batchbook. Agents can also create Batchbook communications directly from Zendesk chats, like in the example below. If you know your Batchbook API Token and account name, you can skip to step 4. Log in to your Batchbook account. From your Zopim account page, go to the Integrations tab and select Batchbook. Enter your API key and account name. Note: To avoid manually entering visitor email addresses in Batchbook, we recommend enabling the Pre-Chat form and requiring visitors to enter their email addresses. For step-by-step instructions, see this article.